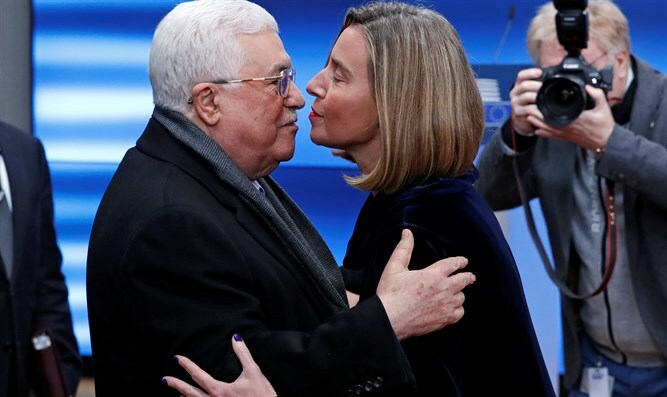 EU diplomatic chief Federica Mogherini urged US reengagement in the Middle East peace process Wednesday after President Donald Trump's recognition of Jerusalem as Israel's capital. "This is a difficult moment," she said after a meeting of international donors in Brussels to discuss the Trump administration's decision to cut aid to the PA.
"If I can put it in a headline, nothing without the United States, nothing with the United States alone," she told a press conference with the visiting foreign minister of Norway, a key donor. "For the United States' [peace] plan, we'll wait and see. We don't have for the moment details or even a time framework, said Mogherini. "For us what counts is first and foremost that everybody recognizes the United States is essential for any process to realistically have a chance to succeed. But also for our American friends to understand that alone it will be more difficult to achieve anything." Trump last week accused the PA of disrespecting the US and threatened to withhold hundreds of millions of dollars in aid until they returned to the negotiating table, reaffirming his Jerusalem decision and noting that Jerusalem had been taken "off the table." The PA has reacted angrily to Trump’s announcement on Jerusalem, saying Trump can no longer be a mediator in talks, and PA Chairman Mahmoud Abbas has worked to have the US replaced with the EU as a broker for future peace talks. Abbas declared last month that he would "no longer accept" any peace plan proposed by the United States. "The United States has proven to be a dishonest mediator in the peace process and we will no longer accept any plan from it."